Rifaximin is an antibiotic drug that is non-systemic, meaning that when taken orally it is not absorbed into the body and thus its effects are limited to the gastrointestinal tract. As a result of this quality rifaximin is used in the treatment of diseases caused by gastrointestinal bacterial infections, primarily traveler's diarrhea caused by E. coli. 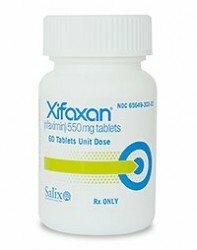 In recent years rifaximin has also been found to be effective in the treatment of small intestinal bacterial overgrowth (SIBO) in which there is abnormally high growth of bacteria in the small intestine. SIBO is associated with symptoms including bloating, flatulence, abdominal pain, and changes in bowel habits, and some studies have found it to be a contributing factor in irritable bowel syndrome (IBS), chronic fatigue syndrome (ME/CFS), and fibromyalgia (FMS).